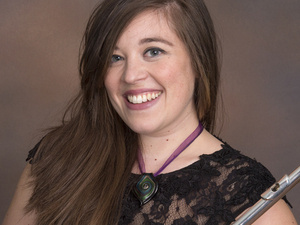 The Frostburg State University Department of Music will present Greek flutist Eftihia V. Arkoudis in a Faculty Artist Series concert titled “ClaZZical Souvenirs!” on Wednesday, April 17, at 7:30 p.m. in the Pealer Recital Hall of FSU’s Woodward D. Pealer Performing Arts Center. The recital is free and open to the public. She will be accompanied on piano by Dr. Joseph Yungen. Arkoudis will first perform “Les Folies d’Espagne,” an early 16th-century piece that imbues variations with Hispanic flair through the hints of strumming guitars. It was composed by Marin Marais, a French composer and viol player who was a musician to the royal court of Versailles. Arkoudis will then perform “Two Sonnets” for the alto flute and piano, composed Mike Mower, a newly commissioned composer who studied classical flute at the Royal Academy of Music in London and has received the Associate of the Royal Academy of Music award. The third piece is titled “Music for Mother Bear” for solo alto flute, a piece composed by Donald Erb, an American composer best known for large orchestral works. She will then present a romance piece by Charles Koechlin, “Épitaphe de Jean Harlow, Op. 164” for flute, alto saxophone and piano. She will be joined by faculty guest artist Dr. Brent Weber on saxophone. Koechlin was a French composer, teacher and writer who created this piece in remembrance of one of his muses, the young actress Jean Harlow, who passed away at the age of 26. Arkoudis’ final piece, the 1990’s “Four Souvenirs” for flute and piano, was composed by Paul Schoenfield, a classical composer known for his integration of popular, folk and classical music arrangements. The piece has four movements, each serving as a modern interpretation of a more traditional folk or popular music genre. Arkoudis, a Trevor James Low Flutes artist, is a versatile performer who joined the faculty of FSU as an adjunct flute instructor while a doctoral candidate at West Virginia University. Arkoudis has performed the world premiere of several new works and has a passion for the theatrical element in her interpretations of music. Arkoudis has served as the principal flutist of Orpheus Kammerochester Wien, Junges Tonkünstler Orchestra, Greek-Turkish Youth Symphony Orchestra, West Virginia Symphony Orchestra and numerous other ensembles, giving her the opportunity to perform and record in prestigious venues of Greece, Austria, Germany and Turkey. Arkoudis has performed in the masterclasses of Alberto Almarza and Caroline Debonne and was selected as a performer for the Jasmine Choi International Masterclass in Austria in 2013 and the William Bennett Flute Academy in the United States in 2017. She is a founding member of the award-winning BETA Quartet.